Simple things. 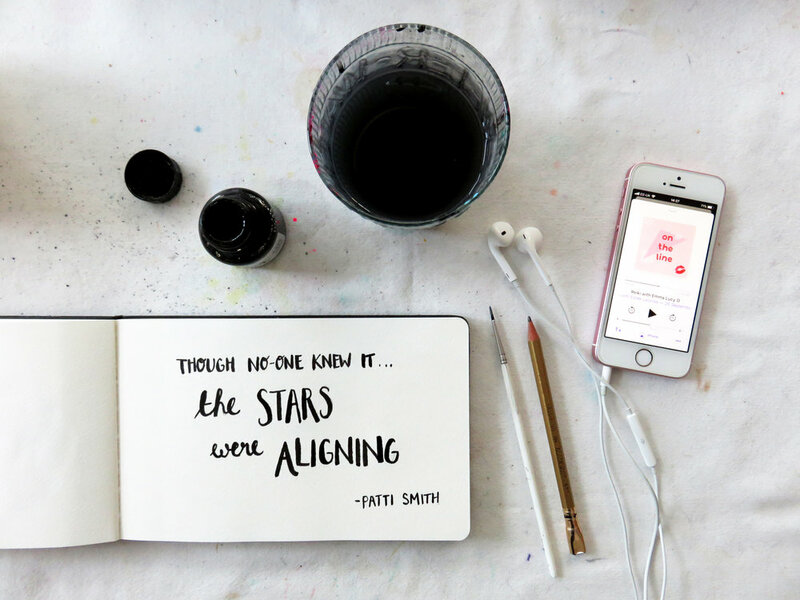 Brushlettering and Estee Lalonde’s new podcast, On The Line, an honest and refreshing listen about every day issues for women. I've recently discovered the Live.Life.Better podcast hosted by Melissa Hemsley and have been listening to it on my commute. I listened to an episode about living clutter-free yesterday. It was perfect timing as I've been Spring cleaning this week. I found myself with three bags full of things to throw out and give to charity and now the bags have gone I really have no idea what was even in them. In the podcast, Sheila Chandra talks about how she was motivated to clear so that she could find things. I could relate as I often tidy or 'get things done' so I don't still have to do them. It allows me to relax. I'm not at all obsessive about it but I relate to the principle of a tidy space making life easier. This week's episode is dedicated to clutter busting and spring cleaning - but how can we make a clutter-free life something that we cary through the whole year round? To help find the answers, Melissa Hemsley is joined by authors Sheila Chandra (Banish Clutter Forever) and Emma Gannon (Ctrl, Alt; Delete) who share practical tips. Like most people, the Beatles are woven into the fabric of my past and have become part of the stories I tell. But what must it have been like to actually grow up with such a superstar Dad, surrounded by music and magnificent musicians? I listened to Stella McCartney's episode of Desert Island Discs as I wondered home through the streets of London and it totally transported me, to the Mull of Kintyre and beyond. It was fascinating to hear an insight into the life of someone who is so creative in her own right but has drawn such inspiration from her parents. It turns out her childhood was surprisingly 'normal' but also wonderfully liberating as Paul and Linda McCartney created a home in the countryside where their children could have freedom to explore while they themselves had space to create their songs. Well worth a listen. As an aside, one of Stella's choices is a beautiful version of George Harrison's perfect song, Something, by a reggae artist called Phyllis Dillon. It reminded me of a time I worked at Abbey Road. They regularly white wash the wall at the front of the recording studios because it gets covered in graffiti so often. I found a clear square and simply wrote 'Something'. I really enjoyed this treat from the Hashtag Authentic podcast series presented by Sara Tasker. This week Sara interviews illustrator Helen Stephens who wrote and illustrated How To Hide A Lion amongst many other books. Helen has a lovely scribbly, warm style which has lots of energy and detail. She describes how she finds inspiration while drawing from life. 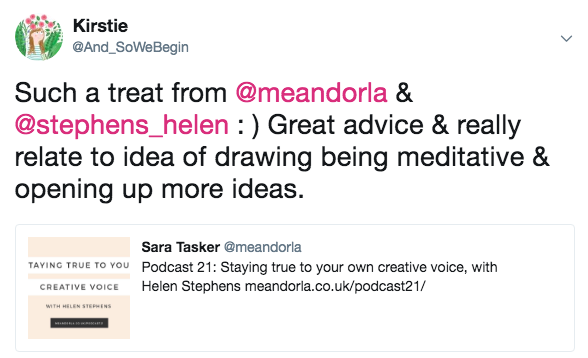 I really agree with her about the almost meditative state you find yourself in while drawing and how this can open your mind to let ideas flood in. Helen also describes how, while her early experience of traditional publishing taught her an awful lot, she found herself straying from her own style. She bravely took a year out to try to get back to her roots. It worked and she now manages to be totally true to herself while still being super successful. Such an inspiring interview. I highly recommend listening to it even if you aren't an illustrator and are just trying to be true to your creative self. Click on the tweet below to go to Sara's site.